Sponsored by World Meteorological Organization (WMO) and China Meteorological Administration (CMA), cosponsored by State Administration of Foreign Expert Affairs and WMO East Asian Monsoon Activity Center/BCC, and hosted by the Beijing Climate Center of CMA, The Eleventh Session of the Forum on Regional Climate Monitoring-Assessment-Prediction for Asia (RAII) was successfully convened during 11-13 May 2015 in Beijing, China. During the opening ceremony, Dr. SONG Lianchu, Director-General of Beijing Climate Center (BCC), and Ms. Anahit Hovsepyan, Representative of WMO Secretariat, made address respectively. Dr. Song indicated that, CMA keeps endeavor in improving climate knowledge and climate information use to address societal needs, BCC and other Regional Climate Centers, will enhance the climate monitoring, prediction, impact assessment and scientific research, improve China’s Climate Service System, and provide scientific support and services for improved adaptation to climate change, usage of climate resources and reduced risks of climate disasters. Ms. Anahit Hovsepyan conveyed greetings of WMO to all participants and express sincre appreciation to the government of China for organizing this important event. She highlighted the importance that WMO attributes to the strenthening climate services, in particular through sustained operation of RCOFs and also National Climate Outlook Forums. The Forum discussed the outputs from various climate system models (BCC/CMA, JMA, and APCC) and used these outputs, to produce a most likely seasonal climate outlookfor the RA II region for summer (June-July-August) of 2015. There were totally 90 participants from 25 countries/territories (China, China Hong Kong, China Macao, Comoros, DPR of Korea, Egypt, France, Ghana, Hungarian, Indonesia, Japan, Kazakhstan, Lao PRD, Malaysia, Maldives, Mauritius, Mongolia, Niger, Pakistan, Republic of Korea, Russia, Thailand, Turky, United Kingdom and United States). 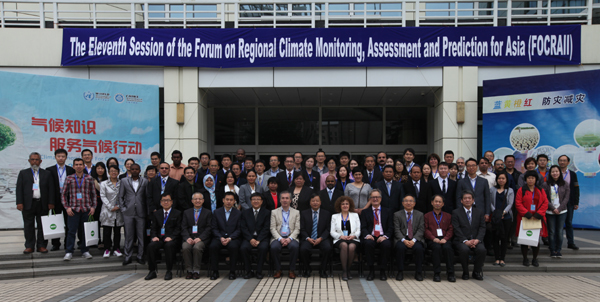 In the summary session, many participants took the chance to comment on the Forum, highly appraised the exchange between climatologists and end-users, which greatly helped to improve climate services especially on seasonal forecast in Asian monsoon region.A “consensus” prediction of the summer climate in the RA II region and a CD-ROM including all presentations were produced. It is agreed that KMA will host the 3rd EASCOF (East ASia winter Climate Outlook Forum) which is formerly the Joint Meeting for the Seasonal Prediction of the East Asian Winter Monsoon in either late October or early November of 2015.